Plan your visit to Amsterdam – We’re extremely late planners, and rarely book anything more than a couple of weeks in advance. So our trip from Bangkok to Amsterdam a few weeks ago was very much our typical last minute travel style, but since we have been to Amsterdam twice before the trip didn’t need much planning – this time we simply wanted to expand on our last few trips. First-timers to Amsterdam have a long list of things to do, but if you’re visiting Amsterdam for a second and maybe third time, chances are that you want to experience something new – something that you haven’t already done. On their first visit to Amsterdam, people usually take boat tours along the canals, rent bikes, check out the red light district, coffee shops and visit museums – which are all some of the best ways to experience Amsterdam, and many which are free with the I Amsterdam City Card. Just a short distance out of Amsterdam, you find Saanse Schanz, an open air museum that looks exactly the way you would picture Netherlands in your mind; quaint wooden houses, weeping willows dipping their branches in the canals, and lots and lots of (still working) windmills. It’s all very real, the houses are authentic and the windmills have been collected from all over the country and moved here to be preserved. You can go inside the windmills, and if you climb the ladder you get an amazing view from the top overlooking the area – it’s a really nice place to visit on a sunny summer day, with a clog shop, bakery, museums and cafes to sit down and enjoy the atmosphere. Useful info: Train tickets cost about €3 each way, and takes around 20 minutes – museums and windmills are free with the City Card. Founded in 1838, the Royal Artis Zoo is one of the oldest Zoo’s in the world, and is a really nice place to spend a couple of hours. The park is very green and wonderfully laid out with small paths and walkways, lakes, and beautiful 19th century buildings. With a planetarium, aquarium and butterfly pavilion it’s really more than a zoo, and there are animals everywhere; from orangutans, giraffes and lions, to small monkeys, beavers and wolves. There is a huge variety, but our favorite parts of the zoo were those where the animals could roam freely among the visitors – there was a beautiful building where you were surrounded by animals everywhere, monkeys in the branches above, and birds on the floor in front of you. 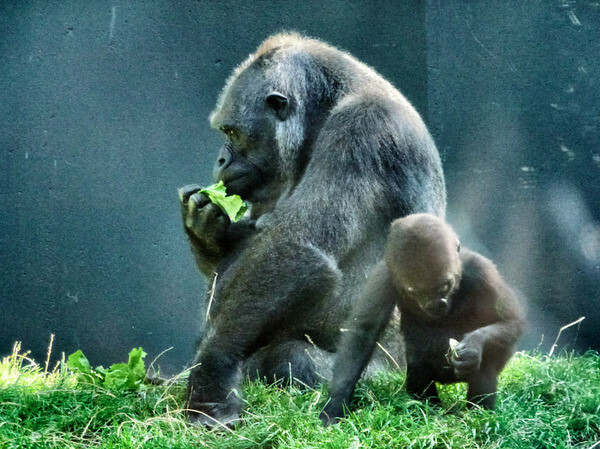 Useful info: The zoo can be reached with tram 9 (from Central Station) and 14 (from Dam Square) – tickets cost €14, but are free with City Card. The air is full of smoke everywhere you go, but it’s not all from what you get at the local coffee shops – in fact, most of it is from the BBQ’s which are everywhere around you – people sit on the sidewalks, by the river, and on the boats – but there is nothing like Amsterdam’s parks. 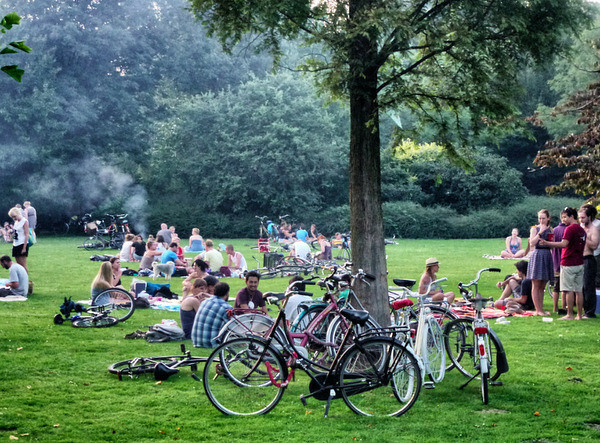 A heavy mist of BBQ smoke lingers over Vondelpark and Westerpark, the two favorite local hang-outs. We’ve never seen a park so consistently full of people on blankets with food and drinks, enjoying the summer evenings until long into the wee hours of night, any day of the week. If you want to go where the locals go, these two parks are the places to visit. One of the coziest park cafes are in the over 300 year old Botanical Garden, a small, lush garden which is one of the very oldest in the world, and a perfect place to relax and have lunch. Useful info: Vondelpark and Westerpark are free for the public, the Botanical Garden costs €7,50, but is free with the City Card. As you can see, and probably noticed on your last visit to Amsterdam, a lot of the best attractions are not necessarily expensive, but you save a lot with the city card if you plan to do a lot of things – and the deal breaker for us was the free transport which we used all the time during our stay in the city. As a modern, vibrant and diverse city Amsterdam will host many different festivals over the forthcoming year – this includes events dedicated to music, theater, film and much more besides. If you’re planning a visit to Amsterdam in 2012 and want to go to a festival while you’re there, here’s a run-down of each month’s best events. This traditionally religious festival at first might seem a bit odd compared to Amsterdam’s reputation as a party city, but it reflects the city’s history as an important center for the Catholic community. It commemorates the 1345 ‘Miracle of Amsterdam’, which involved the salvation of a dying man, and attracts thousands to walk silently through the city. Officially a celebration of the Queen Mother’s birthday, this festival is actually just a good old-fashioned party. Queens day is a national celebration that is particularly poignant in Amsterdam, with 750,000 visitors. They all wear orange, the national color of Holland, and enjoy street stalls, games and parties. This modern art fair draws visitors from around the world to see the best in modern and contemporary art. The Holland festival is an international performing arts event that includes theater, dance and cinema. Over the month long festival, performances take place across the city, and include both traditional and experimental artists in various different languages. Say hello to five days of roots music with a showcase of international bands and DJs. Much of the music is European in origin, but the festival includes acts from across the world. The first four days of the festival take place in venues across the city – the last day is a free open-air event with seven stages. This classical music festival includes over eighty performances from artists playing everything from professional clarinets to violins. Venues are spread across the city and include not just traditional concert halls but open-air stages, historic buildings and even people’s homes. Contemporary art shows in an old shipyard depot, which has now been abandoned and makes a fantastic usable space for artists. The industrial setting of the Robodock Arts Festival creates a unique experience, with fire performances and gritty machinery. Probably one of the most unusual festivals the city has to offer. One of Europe’s biggest dance festivals, the Amsterdam Dance Event attracts over 110,000 ravers each year – it also attracts both big names in dance music, and some smaller, experimental and up-coming acts. Running over four days the event includes a wide range of electronic music such as house, drum and bass, trance and techno. Known to many as they IDFA, this is a celebration of the world of documentary film making. The event has been running for 25 years and is unique. Documentaries about anything and everything show at venues across the city center – the festival acts as a place for both professionals and audiences to gain inspiration. If you’re inspired by the idea of attending a festival in Amsterdam the next thing to do is to find somewhere to stay. You may even hear some festival stories to gear you up for your own adventure! How London compares to Amsterdam – If you polled people on the street about whether they’d rather visit London or Amsterdam, what do you think the results would be? You might say that most people would visit London. It’s a city that’s packed with history and culture along with a long list of worthy sights. However, Amsterdam provides experiences that are no less enriching and might be more enjoyable. Ask anyone who’s been to London and you’re likely to get an enthusiastic response. They loved visiting the Tower and Buckingham Palace, but their opinion will probably be colored by negative impressions as well. For one, London is notoriously expensive. It’s impossible to buy anything from a cup of tea to a night at a hotel without spending a fortune. With eight-and-a-half million residents plus countless tourists, you’re bound to wait in line everywhere. You’ll be jostled and elbowed, and you can forget about having personal space. Getting around London can be a headache too. Plus, the government enacts a congestion fee that makes driving and parking prohibitive. Taking public transport is an option, but it has issues too. The famous Tube is often shut down for maintenance or because of strikes. When it’s running, it tends to be crowded. If you visit during the summer, your Underground trip is likely to be hot and uncomfortable. In fact, London is known for having over-the-top summer temperatures and uncomfortable humidity. Combine that with rampant air pollution and London becomes a less-than-pleasant place for tourists. Now, compare that with lovely, quiet Amsterdam. Home to about 780,000, Amsterdam is compact, cozy and welcoming. It’s possible to bike or walk everywhere. You won’t have to consider driving, even if you decide to wander outside the city. Efficient, reliable train service takes you to the countryside and neighboring cities in a short amount of time. Most people who have experienced both cities agree that Amsterdam compares favorably as a vacation destination. The pace in Amsterdam tends to be more leisurely than that in London, which makes it the perfect choice if you’re looking to enjoy a little relaxation with your culture. Plus, in Amsterdam you’ll still have a long list of attractions to visit, but you’re less likely to encounter unbearable crowds. The capital of the Netherlands also has a more temperate summer climate and a good deal less pollution, making it a comfortable place to spend a few days. While even a person with a casual interest in travel could probably mention a handful of famous attractions in London, it’s less likely that the same person could rattle off Amsterdam’s best sights. That’s a shame, because it has some genuinely remarkable things to see and do. One of the best reasons to visit the city is to explore the museums. Whether your interest is history or art, you’ll find amazing collections throughout the city. You might tour the Rijksmuseum to see iconic works by Old Dutch masters or the Stedelijk to see breathtaking works by modern artists. If history fascinates you, you’ll have difficulty choosing which site to visit first. The Anne Frank House offers a poignant look at the tragic life of a young Jewish girl growing up during World War II while the Amsterdam Museum examines the city’s amazing evolution since 1200 AD. No visit to Amsterdam could be complete without touring at least one of the world-famous flower markets. Perhaps the most popular of these is the Bloemenmarkt. Located along the historic Singel Canal, which circled the entire city during the Middle Ages, the Bloemenmarkt is one of the best places in the city to enjoy a leisurely walk, take photographs and indulge in a delicious café lunch. Of course, Amsterdam’s many canals are an attraction all by themselves. They are bordered on both sides by picturesque, historic buildings, many of which now house shops and restaurants. Many a tourist has spent an enjoyable day simply strolling among these historic sights. Of course, Amsterdam also offers visitors a chance to walk on the wild side. Its notorious Red Light District is known throughout Europe for its ability to cater to any number of unusual proclivities, and many tourists are fascinated by the availability of certain soft drugs in some of Amsterdam’s coffee shops. Visitors who aren’t interested in anything quite that wild can still have a fantastic time dancing and drinking in the city’s many nightclubs and lounges. While both London and Amsterdam offer unique and fascinating experiences for tourists, many come to prefer Amsterdam for its laid-back, friendly attitude. This, combined with less congestion and fewer crowds, make the city a wonderful place to spend a few days. If you’re looking to enjoy some relaxation that still provides plenty of cultural attractions, then Amsterdam is the city for you. The infographic represents a visual graphic and text about the most exciting cities in Europe: London vs Amsterdam. Amsterdam is rich in history, art and culture. Beautiful sights can be admired from old churches to world class museums the Rijksmuseum, trough the intense expressionist Van Gogh paintings,from famous canal houses to the famous Anne Frank House or Rembrandt House to modern building the Eye Filmmuseum. You can reach by foot or get on a bike to visit the city center. Do not miss in spring the tulips display at Keukenhof or the culinary delights, the well-known cheese or Heineken the famous brewery. There are a lot of things to do and see in Amsterdam. When visiting fantastic London sights, landmarks and monuments take the London bus tour and the highlights of Tower Bridge, Buckingham Palace, Parliament and Big Ben are must-see architectural icons. London has something to offer for everyone.Admirers of art will not miss the National Gallery, the city is rich in historical attractions for everyone. In the summer the boating lakes, Serpentine lake or catch a performance at the Little Angel Theatre, visit the Tate Modern or discover the major scientific progress in the last 300 years in the Science Museum. That is why you may feel overwhelmed by the degree of choices when discovering London, a city without compare. 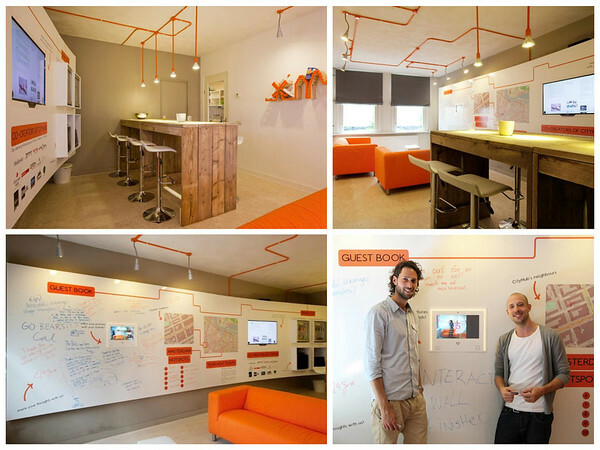 CityHub Amsterdam – Changing Budget Accommodation! We are always on the look-out for new ideas and concepts in the travel industry, and when we found out about CityHub Amsterdam we knew straight away that this was something out of the ordinary, and something we had to experience. During the past few years, the way people travel has changed drastically. Not only are we completely intertwined with technology, but we are getting pickier, and our needs are more and more difficult to satisfy. Today, a stinky crammed dorm bed is not enough – we want comfort, wifi, good locations, privacy and social interactions – and all of it for budget prices. Out of all these variables, CityHub has come up with a fun, urban alternative to your ordinary hotel, combining the social vibe and technology, with privacy and comfort, and a revolutionary room idea to save space and keep the prices low. The rooms, or “hubs”, are private sleeping units in something that looks like a futuristic “box”. Each hub features a large comfortable double bed, a makeup mirror and table, bench, mood lights around the bed, and built-in speakers installed in each hub which you can connect to your iPhone. Downstairs is a hang-out lounge where you can meet other travelers or watch the live-feed on CityHub’s Facebook page (which in the future will be a way for guests to get tips from the hosts while out exploring the city) to get tips and updates of what’s happening in Amsterdam. The location is fantastic, right next to Vondelpark (one of our favorite places in the city) and surrounded by lots of shops and cafes. Sem, one of the founders and the host of the week, is a great guy, very friendly and social and we liked how he really spent time with the guests, making everyone feel welcome and at home. The hotel is just in beta mode, and has only been open to guests for a couple of weeks, but is already fully booked for the next few months – which tells you that this is the type of hotel people have been waiting for. The idea is to become an interactive hotel, both online as well as at the hotel itself, and the owners have a lot of ideas on where and how to take it all to the next level. We’re excited to see what CityHub will turn into in the next couple of months, and definitely recommend that you check it out next time you’re in Amsterdam! 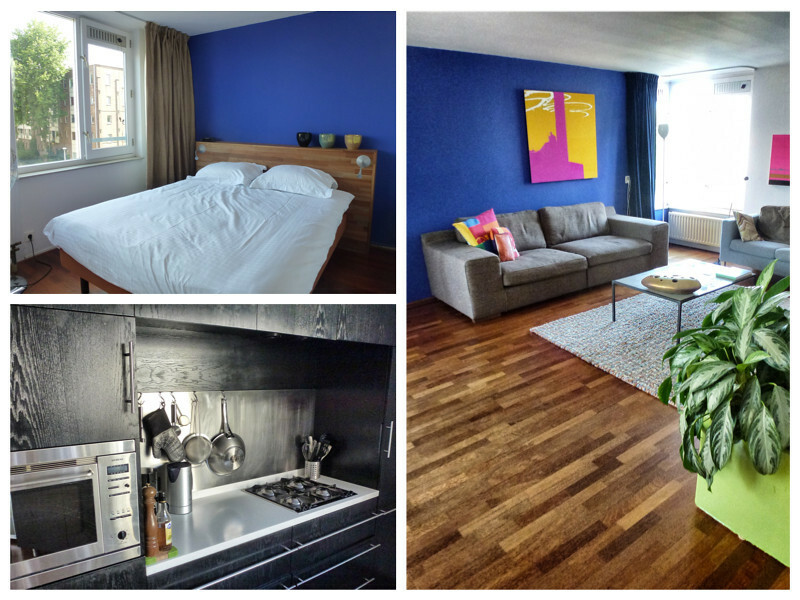 Recently Wimdu invited us to stay at one of the apartments listed on their site while in Amsterdam – which turned out to be a great alternative to the many overpriced and lousy hotels that are scattered over the city. 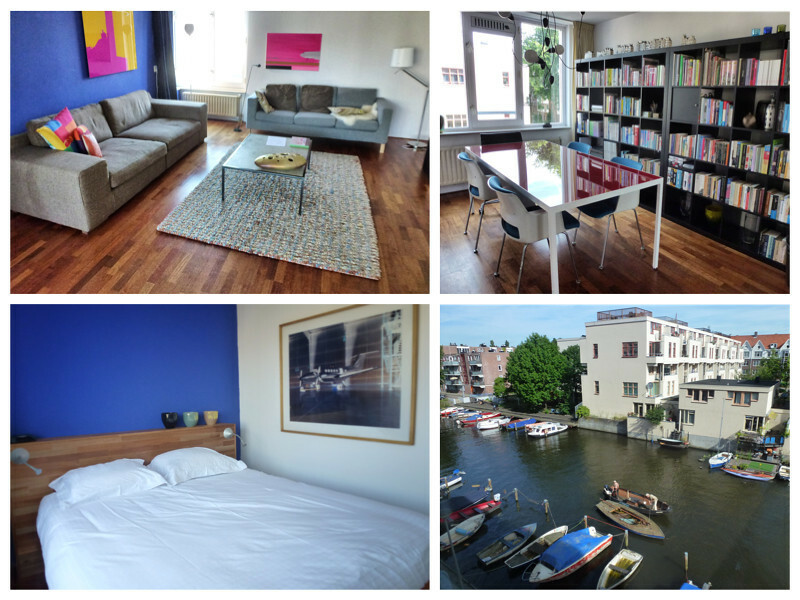 While searching the website we found an amazing apartment in Amsterdam close to Westerpark, an area we had yet to explore, and one that many tourists miss out on. The pictures on Wimdu looked really nice, and with 90 square meters and amenities like a Jacuzzi, dining room and a beautiful balcony, the apartment offered more than we needed! Just as arranged on Wimdu, the host welcomed us into his apartment, which was located in a really nice neighborhood with views over a canal, and just a quick walk to many of the most beautiful parts of the city. Westerpark was packed with people enjoying the warmest days of summer, the beautiful Jordaan area was just minutes away, and there were some really nice local bars and cafes around the area. From contacting the host, to booking the apartment and actually meeting our host in person, everything went very smoothly with Wimdu. If this huge apartment was an actual hotel suite, the price would have been way above a normal travelers budget – so it’s pretty amazing how much more you get for your money, and the possibility to cook your own food definitely brings down the costs. In case you didn’t know – Wimdu is a booking site where people rent out their spaces (whether it’s an apartment, room, house etc) to travelers visiting their town. Some people only rent out a room in their home, others entire houses and apartments, and the result is a more local stay and higher quality of accommodation for a lower price than normal hotels – you contact the host through Wimdu and book your stay through the website. Once you have booked your stay you get all the information you need about the exact location, the key-handover and other important things you need to know – our experience was great, so we would definitely recommend using them for your next holiday! Amsterdam visitors never run out of things to do – this lovely old city has a city center that’s quiet and perfect for walking and biking – with over 1200 bridges and more than 150 canals located in Amsterdam, the beauty is breathtaking. 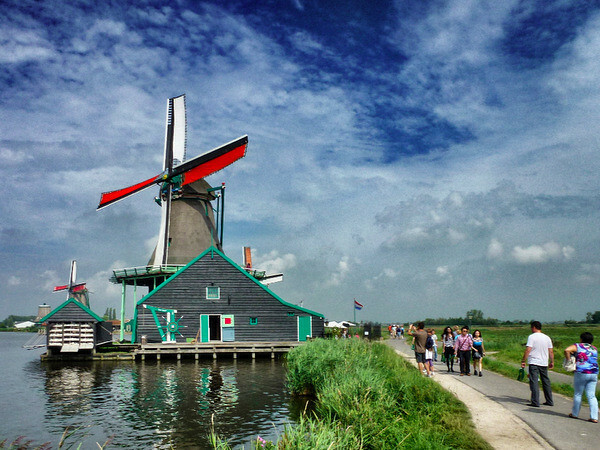 Take a ride in a glass top boat, enjoy a stroll through the 9 streets, tour the Van Gogh Museum or simply enjoy a sunny afternoon in the country to see windmills and fields blooming with gorgeous tulips. You will probably be arriving at Amsterdam Airport Schiphol, which is one of the busiest airports in the world. Although that doesn’t sound like the best way to start a holiday, the good thing about it is that it’s easy to find cheap flights to Amsterdam, with low cost carriers such as Transavia, EasyJet and Jet2 all catering the city. Finding cheap hotels in Amsterdam, however, is more difficult, but in this city location is everything – and few places beat Crowne Plaza when it comes to this. It has received raving reviews, especially for location because it is situated in the heart of the city. For something more budget conscious, a new hotel concept with beds starting from €40 per night. Of course you’re going to want to eat, and Amsterdam has some great local restaurants. Stop in at the Grand Cafe, a comfortable restaurant for the weary traveler or the Supper club for a more trendy style that is popular in Amsterdam. An Amsterdam Brown Pub has food and drink and you may enjoy listening to live folk music while you’re here. The Anne Frank Museum and the Van Gogh Museum are also favorites. Learn about Anne Frank and her family as they hid from the German Nazis during World War II and enjoy viewing the famous Vincent Van Gogh paintings while visiting Amsterdam. Shop at antique stores, specialty shops and a flea market as well while visiting Amsterdam. The Spiegelstraat Antique Store is filled with quaint furniture and relics from the past, and The Oude is a specialty shop that you must visit. The 9th Street shops await you as well. Amsterdam is not your typical bustling city. The city center is peaceful and quiet so you can walk or ride a rented bicycle all day long. Enjoy Amsterdams folk music, take in the beauty of the windmills and tulips, see the canals and bridges from a glass top boat or just stroll along 9th street to window shop while visiting Amsterdam. Very nice article. I really wanted to visit Amsterdam this summer but didn’t have the time. You make me regret not going even more now :). Cheers, David. The tips were great but since I haven’t visited the country even once, I would like to read the tips for the first time tour as well. thanks for sharing your tips, didn’t know about the pizzeria san marco place, looks cool. maybe we’ll write another article about the must do’s of Amsterdam, but until then you can always check out our previous posts about the city: http://www.aswetravel.com/top-5-places-to-cycle-in-amsterdam/ or .